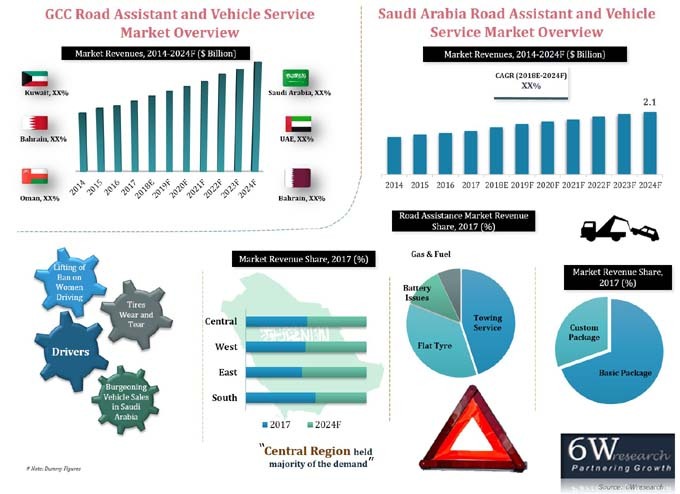 Projected growth in on road fleet size, increase in sale of commercial vehicles, and growing urbanization are some of the key factors that are resulting in the overall growth of the Saudi Arabia road assistance and vehicle service market revenues. However, implementation of expatriate tax and VAT on goods and services in 2017 would affect the market demand during the forecast period. In Saudi Arabia basic package segment generated majority of the market revenues due to low pricing coupled with OEMs policy to provide basic services as a part of benefit to the new vehicle owners. According to 6Wresearch, Saudi Arabia road assistance and vehicle service market size is projected to reach $2.1 billion by 2024. Market registered a decline in revenue during 2014-17 due to weakening oil prices and economic conditions of the country which also, affected the disposable income of the households. Saudi Arabia witnessed a decline of over 25% in the car sales during the first 3 quarters of 2017, resulting in decline in vehicle service market revenues in 2017. The market is anticipated to bounce back with the recovery of oil prices post 2017. Also, government announcement of lifting of ban on women driving passenger cars and commercial vehicle would result in increase in demand for road assistance services in the forecast period. In the Saudi Arabia, central region held major revenue share in the overall Saudi Arabia road assistance and vehicle service market share on the back of increasing vehicle sales and growing urbanization. Eastern region is expected to register maximum growth during the forecast period due to increase in sale of heavy commercial vehicle in the region. Saudi Arabia road assistance and vehicle service market report thoroughly covers the market by road assistance and vehicle service by package types, and regions. Saudi Arabia road assistance and vehicle service market outlook report provides an unbiased and detailed analysis of the on-going Saudi Arabia road assistance and vehicle service market trends, opportunities/ high growth areas, market drivers, which would help stakeholders to device and align market strategies according to the current and future market dynamics. • Historical data of GCC Road Assistance and Vehicle Service Market for the Period 2014-2017. • Market Size & Forecast of GCC Road Assistance and Vehicle Service Market until 2024.
and Vehicle Service Market Forecast Revenues until 2024. • Historic data of Saudi Arabia Road Assistance Service Market Revenues 2014-2017. • Market Size & Forecast of Saudi Arabia Road Assistance Service Market Revenues until 2024. • Historic data of Saudi Arabia Vehicle Service Market Revenues 2014-2017. • Market Size & Forecast of Saudi Arabia Vehicle Service Market Revenues until 2024. • Historic data of Saudi Arabia Road Assistance and Vehicle Service Market Revenues, By Package Type 2014-2017. By Package Type until 2024. • Historical data and Forecast of Saudi Arabia road assistance and vehicle service Market, By Regions. • Saudi Arabia Road Assistance and Vehicle Service Market Trends. • Saudi Arabia Road Assistance and Vehicle Service Market Drivers and Restraints. • Saudi Arabia Road Assistance and Vehicle Service Market Industry Life Cycle. • Saudi Arabia Road Assistance and Vehicle Service Market Porter's Five Forces Analysis. • Saudi Arabia Road Assistance and Vehicle Service Market Overview on Competitive Landscape.